Carbon analogs of carbohydrates, dubbed C-glycosides, have remained an important and interesting class of mimetics, be it in natural product synthesis, for pharmacological applications, as conformational probes, or for biological studies. C-Furanosides: Synthesis and Stereochemistry provides a much-needed overview of synthetic and stereochemical principles for C-furanosides: analogs of a 5-membered ring carbohydrate glycoside (furanoside), in which the anomeric oxygen has been replaced with a carbon. While our understanding of conformational behavior and of stereoselective synthesis in 6-membered ring compounds is quite good, our ability to predict the conformation of 5-membered ring compounds, or to predict the stereochemical outcome of a given reaction, remains anecdotal. 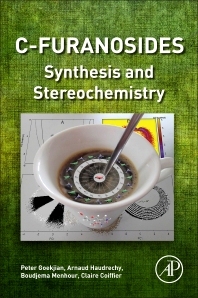 Through a comprehensive review of literature approaches to the different C-furanoside stereoisomers, as well as an interpretation of the outcome in terms of a reasonable number of stereochemical models, C-Furanosides: Synthesis and Stereochemistry enables the reader to determine the best approach to a particular C-glycoside compound, and also hopes to provide a certain level of rationalization and predictability for the synthesis of new systems. Dr. Peter Goekjian has been Professor of Chemistry at Université Claude Bernard–Lyon 1, France, since September 2000. His research interests are carbohydrate chemistry, total synthesis of glycosidic natural products, targeted methodology, and the role of glycosylation in signal transduction and gene expression. He was involved in the early work on the use of C-glycosides as conformational probes in the late 1980s and early 1990s. Dr. Arnaud Haudrechy has been a Professor of Chemistry at the Université of Reims Champagne Ardenne, France, since September 2003. His research interests include carbohydrate chemistry, total synthesis of natural substances, development of methodologies, and didactical techniques. He was involved in the early work on the use of C-glycosides as conformational probes in the late 1980s and early 1990s. Dr. Boudjema Menhour has a PhD in Organic Chemistry and is a researcher at the Institute of Molecular Chemistry, Reims (ICMR), University of Reims Champagne-Ardenne, Reims, France. He research interests include developing a synthesis of carbohydrate analogues, targeting a specific activity, such as immunostimulatory, and eliciting properties. Claire Coiffier, PhD, is a researcher at the Institute of Molecular Chemistry, Reims (ICMR), University of Reims Champagne-Ardenne, Reims, France. She has worked on the top-down approach for the synthesis of biologically active substrates and on the analysis of preferred conformations of C-furanosides, using theoretical chemistry.